Our own brand, Expresso Coffee, reflects our love of coffee and passion for offering exceptional machines that deliver amazing drinks using fresh, carefully selected beans & ingredients, set up by our in-house barista. 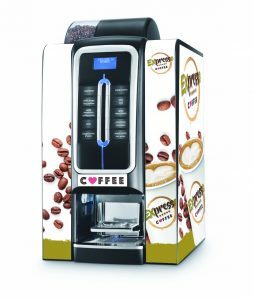 We are passionate about bringing you the best coffee at the best price that works well in your machines. We only use fresh, carefully selected highest quality beans and ingredients. This coffee is stamped with a roasted-on date, for guaranteed freshness. Experts all agree that the freshest coffee is the best. We roast every couple of weeks, ensuring an extraordinary cup of coffee every time. We are proud to bring you the highest quality blends, set up by our in-house barista. We have a choice of 2 blends; Italia Professional and Crema Java both using only the finest ingredients. We are coffee connoisseurs, with a great deal of experience and have worked hard to ensure these blends are of the highest standard. For every box sold, we will donate £1 to a local charity. We have asked the local community to be involved in picking this charity and we are delighted to be supporting William’s Fund charity. Working with the local community and giving something back is very important to us. We are passionate about bringing you the best coffee at the best price that works well in your machines. Furthermore, we offer a complimentary optimisation service complete with brewer servicing to make sure your machines are perfectly set up to dispense amazing coffee throughout their life when you use our brand. Italia Professional: Full bodied, intense espresso. Notes of dark chocolate and subtle roasted nut, with a long bitter-sweet finish. Origins: Brazil, Honduras, Djimmah, Vietnam. Crema Java: Full bodied and full of flavour. Rich deep cocoa balanced by some sweet caramel notes and subtle roasted hazelnuts in the background. A smooth and creamy mouthfeel with a long syrupy finish. Origins: Brazil, Vietnam, Ethiopia and Indonesia. If you have any questions or if you would like to know more, then please don’t hesitate to get in touch.